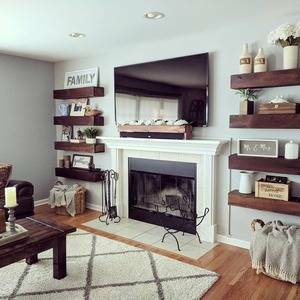 We built floating shelves to flank our TV and fireplace. Inspired by Shanty 2 Chic! Also homemade in the picture is the coffee table and flower box over the sound bar. Rustic is our favorite! We really like that you used so many of the floating shelves to create a really nice look!